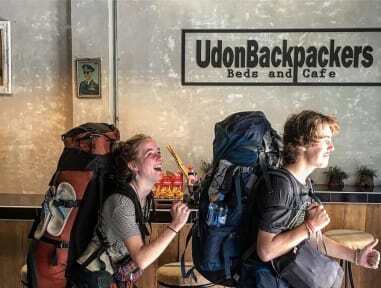 UdonBackpackers Beds and Cafe i Udon Thani, Thailand: Reservér nu! **Key Card Access , Locker+Key, CCTV. Udonbakpackers Beds and cafe is located in Heart of Udonthani City Center . Second walking to all major attractions and interesting spots of the city. From our super-convenient location, numerous travelling destinations, with charming combination of cultural heritages, old-town sceneries, department stores, restaurants and clubs are waiting to be explored. An industrial loft style of Quality Hostel, All Air-Condition Rooms and Cool Bar. Our ground floor, where you can find the Bar and Cafe , is open for everyone, so you have the opportunity to meet people from all over the world and , at the same time, feel like a local people in our Udonthani city.